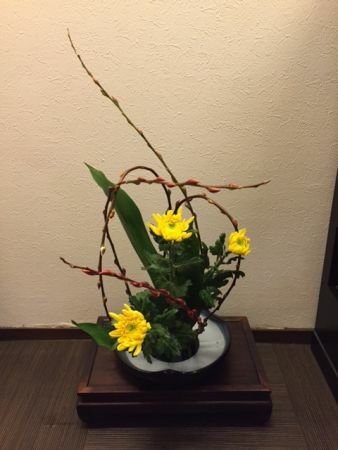 Japanese flower arrangement makes Happy New Year! Temples and shrines in Kyoto start preparing for the New Year from December 13th every year, but maybe common men in Japan start after Christmas. 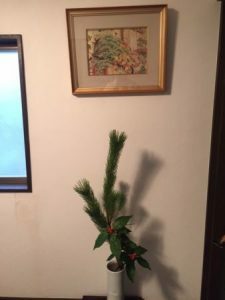 We decorate pine tree, sacred shrine ropes, and Kagami rice cakes, which are thought as the landmark for the year gods to come. Since they are for gods, we avoid “only one day preparation” in 31st or start preparation from 29th which sounds same as “trouble” in Japanese. So, we can see a lot of New Year’s decoration in front of the houses from 27th or 28th in December. Not only outside, but also inside home, how about decorating special Japanese flower arrangements for New Year? Pine tree is often used for cerebration in Japan, because we think its permanent green color even in winter as the lucky things or the origin of vital energies. I belong to one of the big flower arrangement school “Misho-ryu” in Japan. 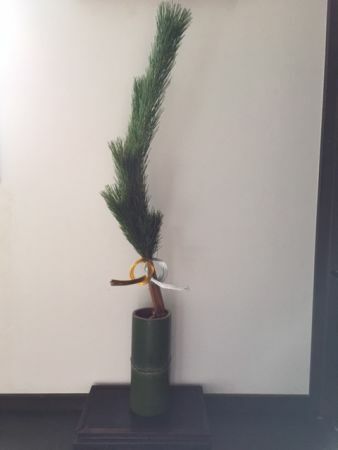 We tie gold & silver Mizuhiki (decorative Japanese cord) on the foot of the tree especially for New Year. Actually, the numbers 7, 5 and 3 are hidden in this decoration. These odd numbers are thought as the lucky numbers because they can’t be divided in two. 7 is the number of the bundle of the traditional cord Mizuhiki. 5 is the number of the pine needles, and 3 is the number of main lines of this decoration. The longest line represents the heaven. The middle line (the length is 3/4 of the longest line) represents human, and the shortest line (half of the longest line) represents the earth. The isosceles triangle is thought as the harmony of these 3. I know foreign tourists don’t have the image of Japanese flower arrangement like this, but actually, this triangle style is the most formal way to decorate on the alcove of tatami room in Japan. This is pine tree as well, but I used Sarcandra glabra for the shortest line instead. Red fruits are pretty. This arrangement is also formal way. 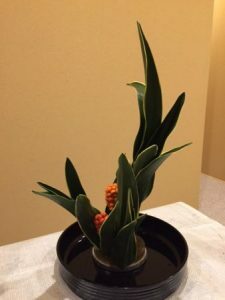 The plant is called “Omoto” in Japanese. Its Chinese characters mean “Permanent green”. Same as pine tree, it shows the vital energy or the continuance of the family. The lucky numbers 7,5 and 3 are hidden also. Can you find where they are? I used 7 leaves for the longest stump, 5 leaves for the middle stump and 3 for the shortest one. These 3 stumps represent a father, a grandfather, and a grandchild. I prepare this flower every December, and they last till the beginning of March if I treat them carefully. I guess these red fruits and green leaves were valuable in winter since there had not been colorful flowers all around the year in the old days. Did you notice that directions of pine tree and Omoto are different? Actually, the directions are changed by the construction of the alcove. If we have a window on the left side on the alcove, the direction like pine tree is suitable while the direction like Omoto is correct for the alcove which has window on the right side. For tea room, we often decorate long willows. 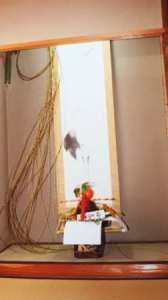 Nail a vase made of fresh green bamboo on the upper of the alcove, tie the willow in the middle, and hang its tip on the floor. Its origin is from Chinese tradition that 3 willows tied circle was sent to a traveler to wish he comes back for sure. Now we hang the long willow to wish we live happy and healthy in the New Year. Compared to triangle ones, this is the new style which we can decorate anywhere including western room. I decorated them freely. Chrysanthemums, red willows, and cast-iron plants. The color contrast is bright and I curved the red willows to make their beautiful lines. We often find the set of flowers for the New Year including chrysanthemums or Sarcandra glabra etc in the big super market or flower shops in the end of December. How about decorating Japanese flower arrangement to cerebrate New Year? 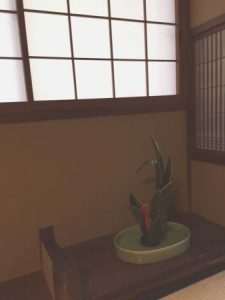 In Tea Ceremony Koto, I usually decorate some flower arrangement in the waiting room next to the tea room. It’s worth seeing to find the difference from flowers in a tea room or western flower arrangements! 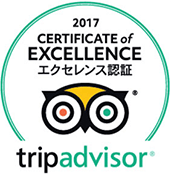 If you would like to learn it, please contact me on the web site.